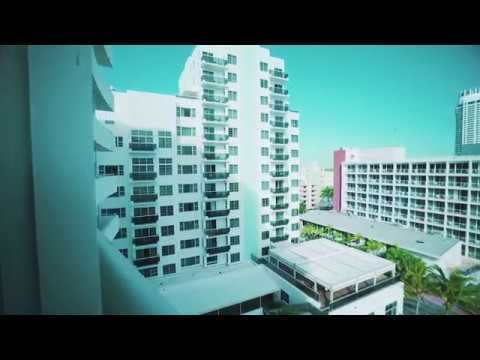 Enjoy one of the world’s most exciting destinations in a hotel voted one of the best in town — The Confidante Miami Beach! Bursting at the seams with Art Deco glamour, it combines bohemian beach chic with the very best in comfort. Stylish, retro guest rooms, designed by Martin Brudnizki, boast city or sparkling ocean views plus there’s a whole range of top-notch amenities to indulge in. The hotel enjoys its very own beach area along with food and beverage service. Alternatively relax by the poolside instead, not only have you got two to choose from but there’s live music to get that tropical vibe going! And for moments when you want to simply de-stress, we recommend a trip to the open-air rooftop spa and salon for a revitalising body massage or detoxifying body wrap. When it comes to eats, Miami has so many restaurants to choose from but you’ll be hard pressed to beat what’s on your doorstep! The Confidante’s restaurants and bars deliver quality dining experiences in unique settings. Bird & Bone is a Southern-inspired restaurant led by celebrated South Florida chef Richard Hales with a popular Sunday brunch. Cafecito Bar serves coffee drinks from local favorites Café Bustelo and Panther Coffee, along with international grab and go food items like guava & cheese pastelitos, yogurt & berry parfaits and gluten-free blueberry muffins. The Backyard menu of casual cuisine and specialty cocktails is available in the gardens, poolside or on the beach. Overlooking Miami Beach with direct access to the ocean. Indian Beach Park, Lincoln Road Mall and the Art Deco Welcome Centre are less than 3 miles away. Driving time from Miami International Airport: 20 minutes. 354 guestrooms and suites designed in a colourful 1950&apos;s inspired style. All of which are air-conditioned with 42" cable TV, WiFI, telephone, USB ports, alarm clock, mini-bar*, safe, hairdryer, bathrobes, iron and board. Standard - 1 King Bed Rooms and Standard Queen Rooms have 1 king-size bed sleeping maximum 2 adults or 2 queen-size beds sleeping maximum 4 adults or 2 adults and 2 children (aged 2-12 years). Connecting rooms are available upon request. Deluxe King City View Rooms have 1 king-size bed sleeping maximum 2 adults. Partial Ocean View Two Queens have a balcony and 2 queen-size beds sleeping maximum 4 adults or 2 adults and 2 children (aged 2-12 years). Partial Ocean View King Rooms have a balcony and 1 king-size bed sleeping maximum 2 adults. Bird & Bone (Southern-inspired restaurant led by celebrated South Florida chef Richard Hales with a popular Sunday brunch). Cafecito Bar (coffee, grab and go snacks). The Backyard (casual cuisine and speciality cocktails available in the garden, poolside or beach). Regular day/evening entertainment with live music. 2 swimming pools (1 adult only). Spa and Salon*. Fitness centre with weekend wellness classes*. Complimentary Wi-Fi. Laundry/dry cleaning facilities*. Room service*. Resort fee includes use of the following amenities - Two beach lounge chairs and towels - Unlimited Wi-Fi throughout the hotel and in the rooms - Local phone calls - Print out of airline boarding pass - Coffee lounge from 6:00–10:30am - 24-hour access to the fitness center - Yoga class on Saturdays and kick-boxing on Sunday&apos;s - Bicycle rental with helmet and lock - Resort fee, tax and inclusions are subject to change - please see hotel check-in for current inclusions available to you upon arrival. 3 nights 5–8 Dec &apos;19 and 21–31 Dec &apos;19. As always wonderful. The hotel was busy but that didn’t mean the staff weren’t up to the job. Great service poolside. Shoutout to Federico who made our time at the pool perfect. Miss the 1930 house as a bar in the evenings.